Hurry Up Download Railway Group D Exam 1st & 2nd shift Question and solve download. Most of the students search on Internet Railway Group D Exam 2018 1st & 2nd shift question paper. Don't worry we solve the problem. This question is collected by memory based. Also, this question helps you to better preparation. Railway Group D Exam 2018 question 17 September is available on our website. Today GK Solve share Railway Group d exam 1st & 2nd shift question paper pdf download link. You can download this question solve paper as soon as possible. 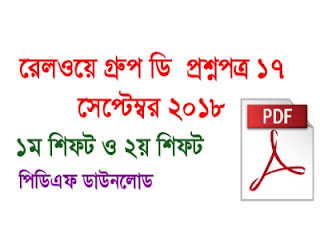 Details of Question paper and download link are given below. In this pdf, the question is solved. So candidates are download this railway group d exam 1st and 2nd shift question as soon as possible.